Are you ready for Thanksgiving? 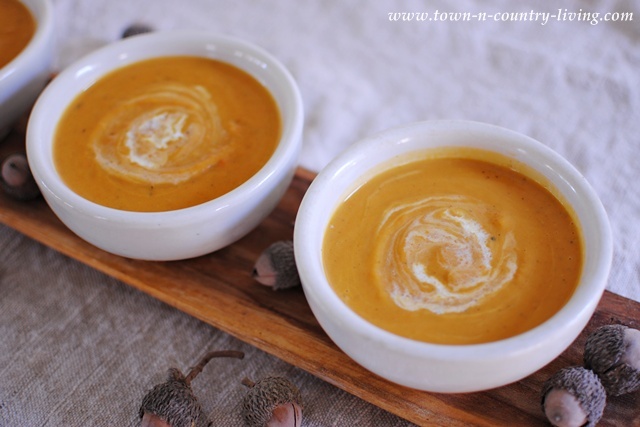 Today I’m sharing a recipe for Savory Butternut Squash Soup that you can serve as the starter course for your Thanksgiving meal. Last year I made a sweeter version of this soup, and truth be told, it was too sweet. So I’m really excited about this recipe which was far less sweet and more savory, perfect as a prelude to turkey and all the trimmings! 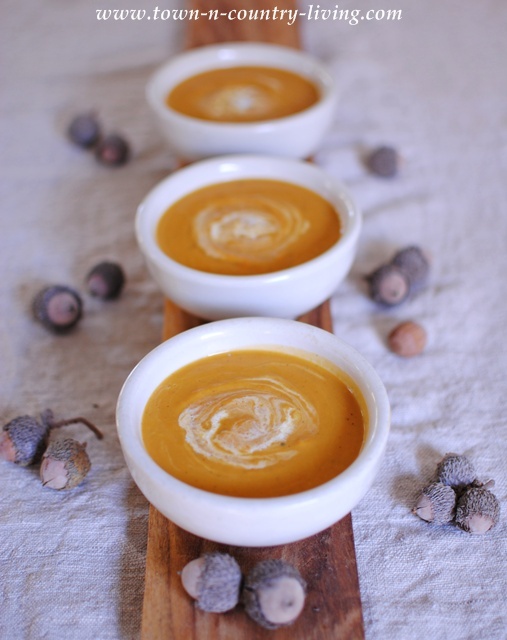 This Savory Butternut Squash Soup recipe comes from the Soupbox in Chicago. Apparently this is a famously popular restaurant in the city. I’ve never been there, but that’s gonna change! I found their cookbook at Barnes and Noble and what a treasure it is! 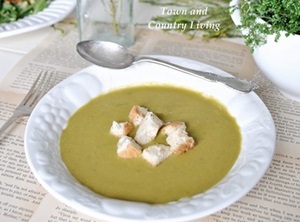 Loads of recipes for all kinds of soups, with gorgeous photography to make your mouth water. 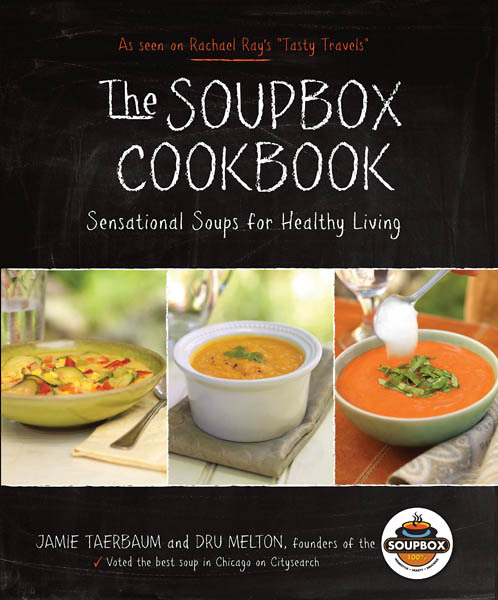 You can order your own copy of this great cook book online! To start, peel and cut a butternut squash into large chunks, along with a sweet onion. 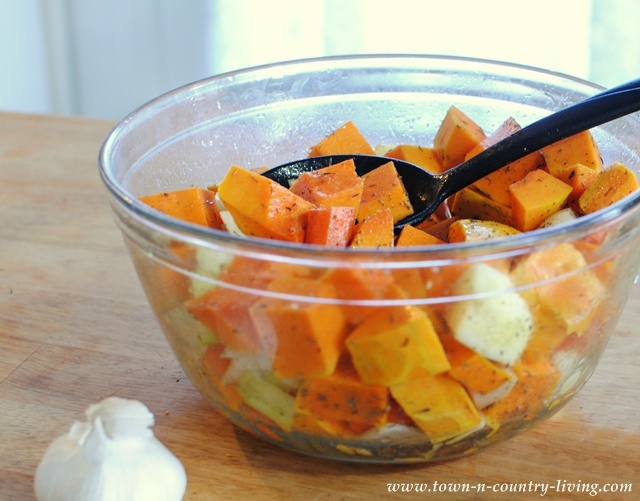 Toss the squash, onion, carrot, and apple with extra virgin olive oil and spices in a big bowl. Spread the veggie mixture on a large baking sheet lined with parchment paper. Roast in the oven to intensify the flavors. Then cook in a pot with the other ingredients. Puree in a blender, and add cream. The original recipe calls for heavy cream, but I used light cream. No need for the extra calories and fat … the soup is hearty enough without heavy cream, in my opinion. A big bowl of this soup can be a meal in itself! But since it’s a starter course for Thanksgiving, use smaller bowls. 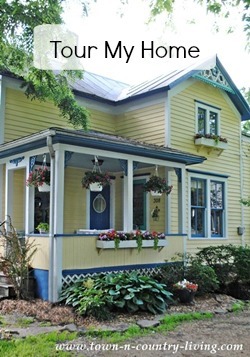 I’m serving it up in my small, white ironstone bowls. The flavor and color are fabulous! Definitely more savory than sweet. At the bottom of the recipe is the schedule of bloggers participating in a Thanksgiving progressive dinner. 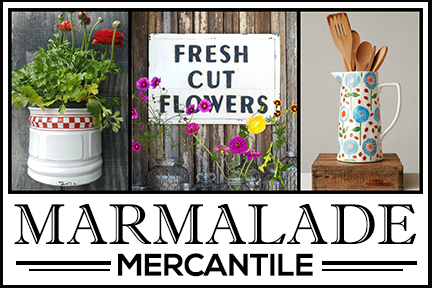 Be sure to visit them and pin recipes you want to try for Thanksgiving or another occasion! Preheat oven to 425 degrees F. Toss squash, carrots, onion, apples, and garlic in large bowl with olive oil and the dried herbs. Spread them on a baking sheet lined with parchment paper or tin foil. 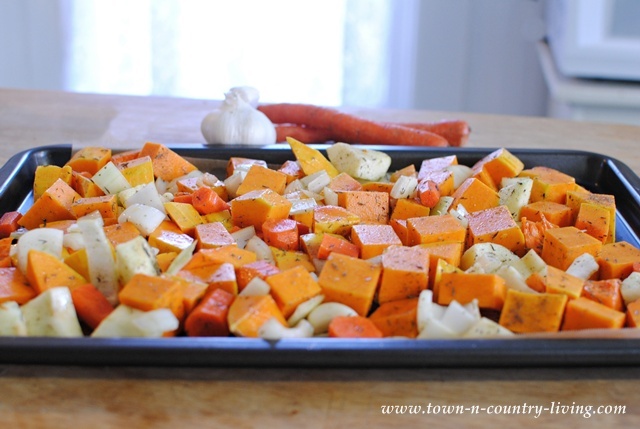 Roast in oven for about 40 minutes, or until squash is tender and lightly browned. Remove from oven and place the vegetable mixture into a large soup pot over medium heat. Add your vegetable stock. I made mine from scratch but you can use store-bought to save some time. You can also make your vegetable stock a day or two ahead, if preferred. Store it in the refrigerator until ready to use. Simmer for 15 minutes and then remove the pot from the heat. Working in 2-3 batches, puree the soup in a blender until smooth. You can add more vegetable stock if the soup is too thick. Stir in cream until thoroughly mixed and serve! 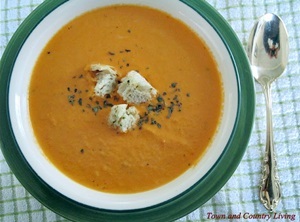 More Soups for You to Try! 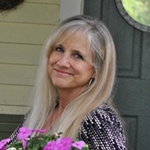 My husband is headed to the store for the fresh ingredients….sounds delightful! I bet that soup takes amazing and it’s gorgeous too! So fun being apart of the virtual dinner with you! 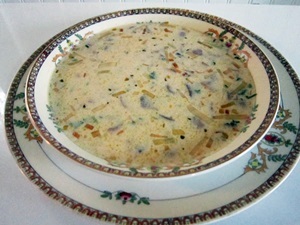 Your soup sounds absolutely delicious and would be a great starter for a Thanksgiving meal. Your food photography is outstanding! Looks so good! I would have never thought to put apples in it, but I will try it like this next time!!! This looks delicious. My sister-in-law always makes a version of this soup and it’s a big hit. I’m definitely saving this one to try for myself at home! Sounds perfect for any cold winter night. This looks delicious! 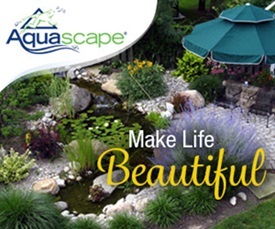 Have a great weekend and it’s been a pleasure being part of the Progressive Dinner with you! Yummy! I love butternut squash so this is definitely made for me! So excited to be part of this virtual dinner with you. Jennifer what a wonderful recipe! 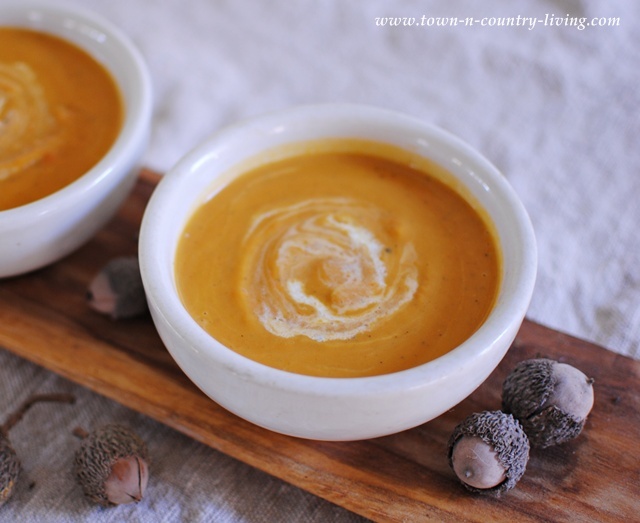 I am making this…maybe even today as it is about to rain so a cozy soup would be perfect! 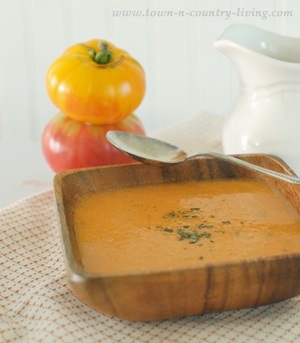 I made your LCI roasted tomato soup & it was such a huge hit., My daughter wants it daily! Fun to be on tour with you…and in Simply Shabblicious together! Oh yum. That soup looks delicious. Happy Thanksgiving! I ordered this kind of soup for lunch yesterday while with friend. OMG! It was so goo. I am pinning this so I can attempt to make it. You should link it up to our Holiday Baking Party today. I’m trying this for the second time right now, thought I’d try BBQing the veggies instead of baking them for a different flavor, will comment once my batch is done on how it turned out! Delicious. I made this soup tonight and it is absolutely fantastic. I added a splash of real maple syrup (Canadian couldn’t resist). It gave it a nice balance of sweetness next to all of the savoury flavours. Keeping this recipe as a regular! What size butternut squash did you use? Or how many cups? Stacey, I want to say it was an average size squash. I didn’t weigh it or measure it. This recipe came out amazing! I really don’t like thick creamy soups because the texture isn’t appealing to me and I was afraid I’d find this too sweet with the apple and carrots but it’s perfect!! I didn’t quite follow the directions exactly, I ended up with way too many vegetables to roast at once so I put them straight into a metal pot on the stove along with fresh rosemary. It was quick, easy and so flavorful. I also added a bit of cream at the end, I will definitely make this soup again!! Julie, I’m so glad you liked it! This soup does have a great balance of savory and sweet. Made this soup tonight for dinner,was so delicious, just like some I’ve had at some trendy restaurants. Thank for the wonderful recipe. I made this today just instead of roasting it in the over then cooking on the hob i roasted the veg for about 20mins then chucked it in the clow cooker and left to do its magic for 3hrs 🙂 it is absolutely ahhhh-mazing ???????????????? This sounds amazing! Looking to make this for a Baby Sprinkle this month. How many servings does your recipe make?? How many does this serve. Hi how many servings would you estimate this recipe makes? I’m making it for this Thanksgiving and I’m not sure if I need to double the recipe. Hi Liz! It serves about 4-6. Hope it’s not too late for this information. Happy Thanksgiving!! Stopping by to say that I’ve made this recipe now a dozen times. I could eat the whole yield of 4-6 servings personally throughout the week, and may have come close a few times to doing so. My mom and girlfriends love when I make it, since now I pre-pack containers for them to avoid consuming the whole batch myself. I just made this but changed it up a bit. Used two small butternut squash’s. 2 small onions, 3 carrots, 6 small cloves of garlic. used two containers of chicken broth. 1 1/2 tablespoons of chicken boullion and 1/4 tsp of cinn. It’s perfect!